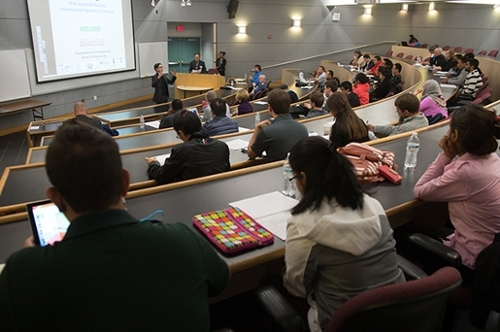 Zhou noted that an important aspect of hosting the event was demonstrating SIUE’s resources and capabilities such as presenting research work at SIUE, showcasing the engineering building and providing a tour of the Environmental Resources Training Center (ERTC). It also enhanced the connection of SIUE’s civil (environmental) engineering program and its faculty to metropolitan St. Louis. The keynote speaker was Brian Hoelscher, executive director and chief executive officer of the Metropolitan St. Louis Sewer District. Along with SIUE, participating schools included Missouri University of Science and Technology, University of Missouri Columbia, Saint Louis University, Southern Illinois University Carbondale and Washington University in St. Louis. SIUE and the St. Louis chapter of the American Society of Civil Engineers-Environmental & Water Resources Institute (ASCE-EWRI) co-sponsored the conference.